Organised within the Sahel and West Africa Week 2018, the 34th RPCA annual meeting focused on nutrition issues. While food availability and access to food still remain key challenges, it is also essential to look more closely at food utilisation in a region that is experiencing a nutritional transition with dietary changes that often come with rapid urbanisation. Members approved a Declaration in which they call for a strong commitment to making nutrition a political and financial priority in the Sahel and West Africa in order to reverse negative and destructive nutritional trends. The Banjul meeting was also an opportunity to share the findings of the second external evaluation of the Charter for Food Crisis Prevention and Management (PREGEC Charter), which focused on assessing the effectiveness of responses to food and nutrition crises. The RPCA members reviewed the provisional results of the agropastoral season, the status of food markets, the macro-economic environment and assess the possible impact of these factors on the region’s food and nutrition situation. Drawing on this analysis, they made recommendations about measures that should be taken to deal with any possible food and nutrition crisis. Members also reviewed the implementation of response plans and the management of transhumance in 2017-18. 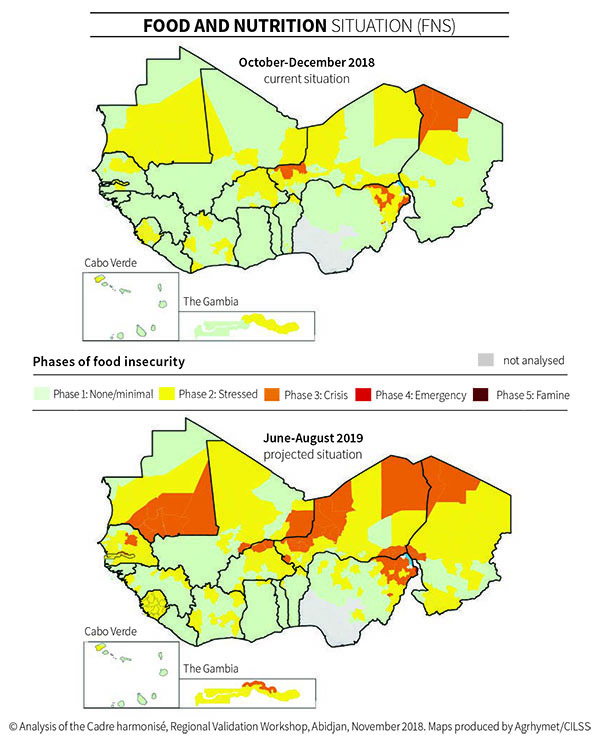 The food and nutrition situation assessment shows that 4.5 million people are in need of assistance during the period October-December, including 182 000 in need of emergency assistance in Nigeria, Mali, The Gambia, Mauritania, Niger and Chad. This situation is due to the deterioration of their livelihoods, which has been aggravated by persistent civil insecurity, particularly in northeastern Nigeria, the area near Lake Chad and Liptako-Gourma. If appropriate measures are not taken, nearly 8.9 million people, including 4.5 million in Nigeria, could be affected by June-August 2019, including 500 000 in urgent need. 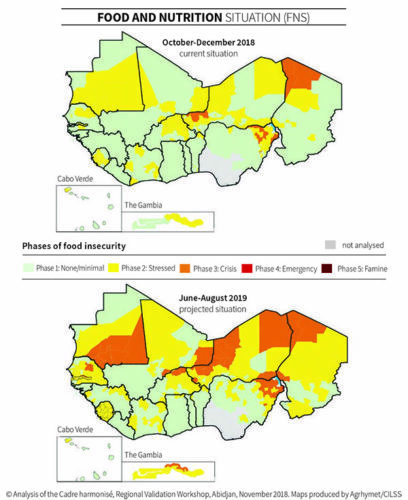 The nutrition situation remains worrying, with a prevalence of global acute malnutrition exceeding 10% in Sahelian countries and exceeding the emergency threshold of 15% in several parts of Chad, Mauritania and Niger. Expand structural investments to counteract the negative trends related to acute and chronic malnutrition and resilience-building. Speed up the implementation of the April 2018 recommendation related to organising a regional conference on sustainable financing and the continuation of food and nutrition security information systems. This session was an opportunity to share the findings of the second external evaluation of the Charter for Food Crisis Prevention and Management (PREGEC Charter), which focused on assessing the effectiveness of responses to food and nutrition crises. A high-level panel debated key recommendations. The nutrition situation remains a cause of concern in this region where prevalence of acute malnutrition in several areas regularly exceeds the emergency threshold of 15%. New nutrition-related risk factors, such as those associated with overweight and obesity, magnify the challenges that governments are already facing and that could have enormous health and economic consequences. This is why the Network has dedicated this year’s thematic session to nutrition issues, under the theme “Scaling up best nutrition practices”. Members approved a Declaration in which they call for a strong commitment to making nutrition a political and financial priority in the Sahel and West Africa in order to reverse negative and destructive nutritional trends. The exercise of capitalising on and sharing experiences and good practices about resilience is continuing, five years after the Global Alliance for Resilience’s (AGIR) regional roadmap was adopted. Following Niger, it was Senegal’s turn to share its achievements and its commitment to strengthening food resilience, particularly around its “New Resilient Terroirs” (NTR) approach. 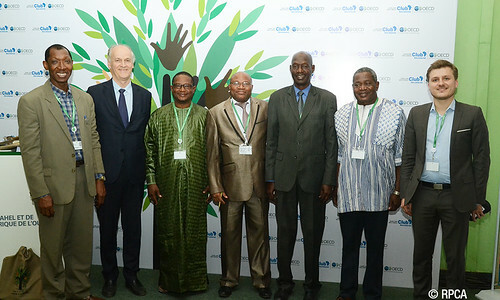 This ECOWAS-UEMOA-CILSS event, organised within the 34th RPCA annual meeting, marked the official launch of the project for “Improving the governance of resilience, food and nutrition security and sustainable agriculture in West Africa (PAGR-SANAD). The project’s specific objective is to build capacity within regional and national institutions to strengthen the regional governance of FNS and agricultural policies in the context of resilience-building in West Africa and with a view to achieving the zero hunger goal by 2025. Component 2: Strengthening of information and monitoring systems of agricultural, food and nutrition security and resilience policies and programmes. Component 3: Support for effective integration of nutrition issues in agricultural and food security policies at country and regional levels. The project is co-ordinated by CILSS under the aegis of ECOWAS and UEMOA, who hold the chairmanship and vice-chairmanship of the regional steering committee.